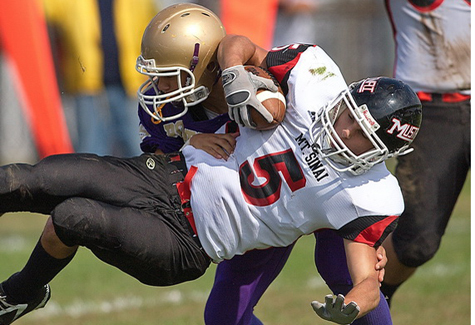 GARRET MEADE PHOTO | Mount Sinai running back Mark Donadio was sent flying on this hit by Christian Angelson, but he ran for 112 yards and two touchdowns in Greenport. Thankfully, it wasn’t a tragedy, but the news was bad enough, scary enough. Three members of the Greenport/Southold/Mattituck/Shelter Island high school football team were in a car accident on Thursday. The vehicle that lineman Connor Anderson, wide receiver/defensive back Nick Lentini and middle linebacker/fullback Chris Schantz were in flipped over, said Porters Coach Jack Martilotta. Fortunately, Martilotta said, it doesn’t appear as if any of the players were injured. GARRET MEADE PHOTO | Tomasz Filipkowski of Greenport/Southold/Mattituck/Shelter Island looked for an opening in Mount Sinai's stingy defense. Nonetheless, the three players — all regular starters — were unavailable to play Saturday, and that wasn’t good news, either. The Mount Sinai Mustangs were in town. Yes, those Mustangs. The same Mustangs who are perennial playoff players, seemingly always near or at the top of the Suffolk County Division IV standings. In their 13 years under Coach Vinny Ammirato, the Mustangs have endured only one losing season. The Mount Sinai football machine is remarkably consistent. The Mustangs usually win, as they did on Saturday. Mark Donadio ran for two first-quarter touchdowns and 112 yards as Mount Sinai breezed to a 34-6 win at Greenport High School’s Dorrie Jackson Memorial Field. “I knew it was going to be a tough game,” said Tomasz Filipkowski, the Porters’ junior running back/linebacker who was limping afterward with a rolled left ankle. Mount Sinai (3-1) ran the ball on all but one of its 33 plays from scrimmage. The only ball thrown by Austin Kay traveled 32 yards. Patrick Hogan caught it and ran into the end zone. Those two seniors, both three-year starters, have connected for a touchdown in each game this season. Kay also had a touchdown himself on a two-yard quarterback sneak. The other Mount Sinai touchdown came on an 18-yard scamper by Mike Donadio. GARRET MEADE PHOTO | Greenport/Southold/Mattituck/Shelter Island's Ryan Malone used a stiff arm to try to hold off Mount Sinai's Zach Wolfe. The Porters (1-3) broke the shutout bid when Ryan Malone took the ball over the goal line on a quarterback keeper 3 minutes 42 seconds into the third quarter. The game was a rematch of last year’s division qualifying round game that Mount Sinai won by a 41-19 score. Since then, however, the Porters have lost 15 players to graduation. They now have a decidedly younger crew to work with. Martilotta said the Porters never had more than three seniors on the field at any one time on Saturday, not to mention a fair share of sophomores short on experience. Young players like Jack Volinski, Christian Angelson, Codey Fisher (a starter on both sides of the ball) and Sal Loverde have been brought up from the junior varsity team and have done well, said Martilotta. He acknowledged that they had essentially been thrown right into the fire against a team of Mount Sinai’s caliber. The young Porters had to contend with a fearsome Mount Sinai defense that conceded only six points in a game for the third time this season. Mount Sinai entered the game tied for third place along with the Shoreham-Wading River Wildcats, the Babylon Panthers and the Center Moriches Red Devils. Seeded fourth in the preseason coaches’ poll, the Mustangs hope to win their first county championship since 2006. That’s their motivation. The bar is set high at Mount Sinai. The Porters can attest to that. Mount Sinai scored touchdowns on its first four offensive series for a secure 27-0 lead by halftime. Martilotta said he did not know when Anderson, Lentini and Schantz would rejoin the team. What he could say was that their absence was felt.